It can almost be called a sky ride. After the completion of a huge new cycle viaduct last Thursday in ʼs-Hertogenbosch, you can now cycle over a motorway, a new canal and a new turbo-roundabout – completely uninterrupted – at a height of 4 to 7 metres above ground level for a distance of 1.2 kilometres. If there is one thing the Dutch are good at, it’s seizing an opportunity when it arises. Sometimes that means combining the replacement of pipes and cables and a new street design, but in this case it was the construction of a new canal that was taken as an incentive to reconstruct the entire road and cycleway network at the east side of the city. The new cycle viaduct seen from the Máximakanaal looking north. All the sand will be covered in green grass very quickly. The plants and trees will take some time to mature, but this will be looking very nice in future. 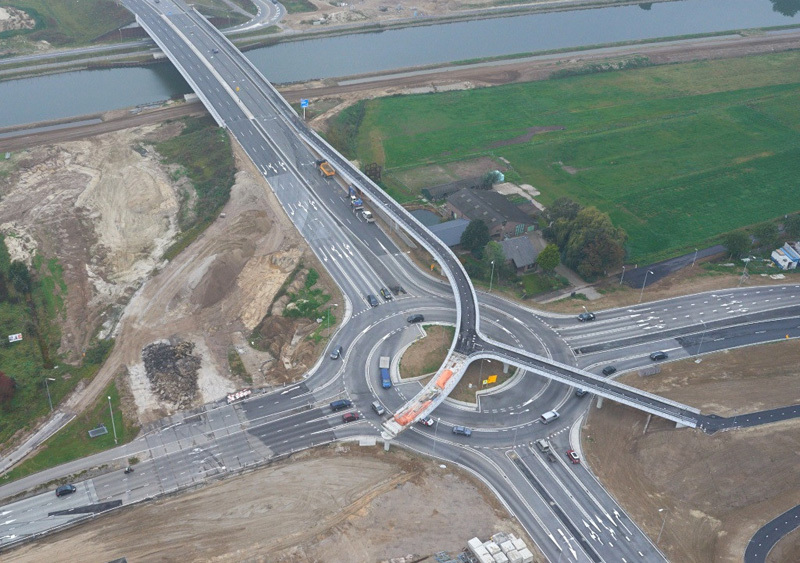 This video shows the new cycle viaduct over the turbo-roundabout betweenʼs-Hertogenbosch and Rosmalen. A few weeks ago I showed you how the cycleway alongside the new Máximakanaal in ʼs-Hertogenbosch looks. But a new canal is also a new barrier. Roads that ran through fields before now need tall bridges, at a height of over 7 metres, to cross this new canal. That led to long new access ramps, that in turn meant several roads and intersections had to be relocated. So why not do it entirely right then, and update those roads and intersections to the latest design standards? 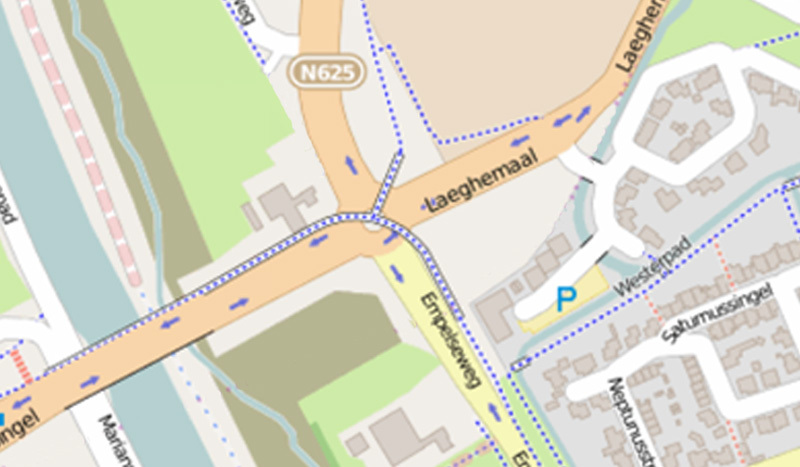 One huge intersection at the entrance of Rosmalen (a former town now belonging to the municipality of ʼs-Hertogenbosch) was changed from a large signalised four arm crossroads into a modern turbo-roundabout that does not require traffic lights. Turbo-roundabouts and cycling do not go together well, unless the cycleways pass the turbo-roundabout grade-separated. The proximity of the tall new bridge over the new canal was taken as an opportunity to have people cycling only go up that height once and to make it possible for them to pass over the canal and the new turbo-roundabout in one go. There already was an overpass over the motorway A2, so all three are now combined. That means that if you cycle you don’t get back to ground level for 1,200 metres. This turned three possible barriers into one easy ‘sky ride’. Google earth shows the former situation at the edge of Rosmalen. 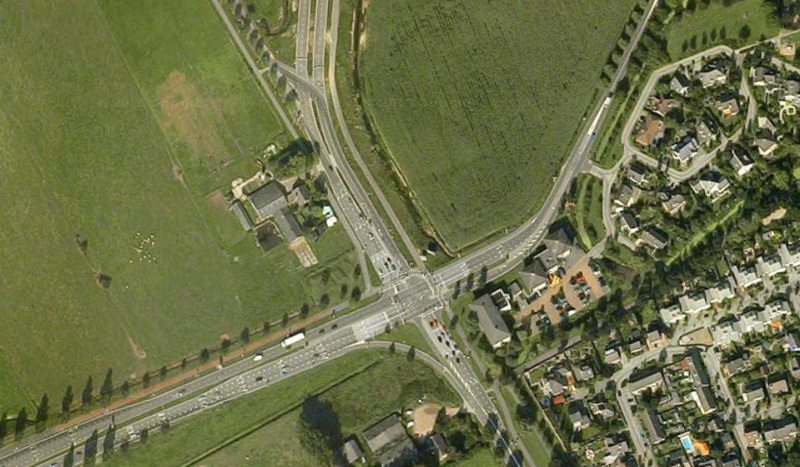 Note how far the farm-house is away from the cross roads (top left hand side). There is not a trace of the canal yet. This photo (courtesy of the municipality of ʼs-Hertogenbosch) shows the temporary situation during construction. Left the canal is also under construction but the bridge is already finished, a bit to the North of the original road. Note that the rest of the road and the intersection will be moved a bit to the north, in the direction of the farm-house as well. The centre part of the cycle viaduct under construction is already clearly visible. The temporary roads make some sharp turns. The current situation as shown in OpenStreetmap. The road is straight again and the cycleways (blue dots) are all very nicely connected. 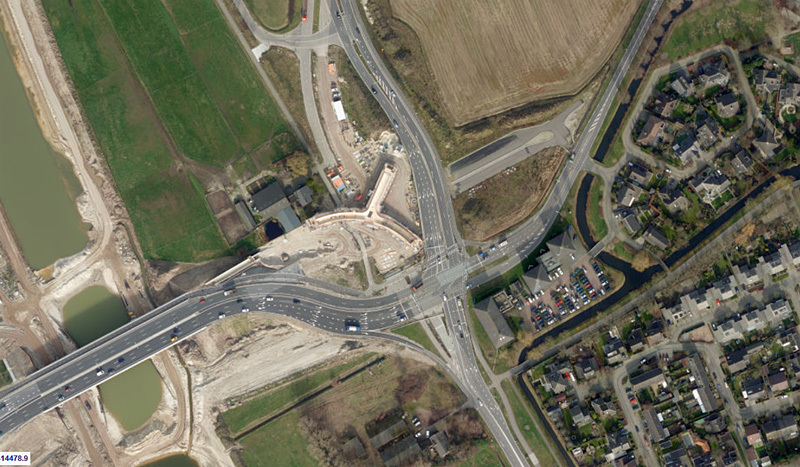 The bridge over the canal and the new turbo-roundabout are not precisely at the original location of the road and the crossroads. That made construction easier. The construction had started with ground works next to the original road in June 2013. Concrete pillars were put in position and the concrete viaduct was constructed on site. Only after the new turbo-roundabout and the cycle viaduct above it were finished and partly opened in November 2014, the original road and intersection were removed. That made constructing the third and final leg and access ramp for the cycle viaduct possible. The viaduct was completely opened last Thursday, 9 April 2015. All that happened was that construction workers simply removed the fences. There was no fanfare, there were no officials. This is just another piece of infrastructure. The cycle viaduct doesn’t even get a name. Video showing several stages of the construction works. The information leaflet of the construction company gives a hint as to why that might be. This viaduct is not meant to be a landmark. 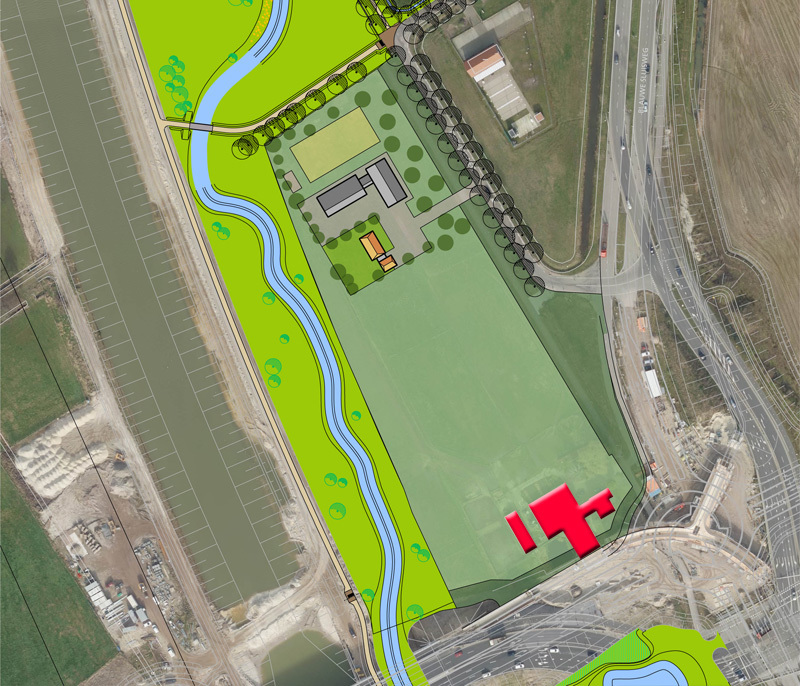 On the contrary, it has to blend into the new park alongside the entire length of the canal. So it was made as thin as possible to make it optically less intrusive. At the same time that emphasises the long horizontal lines. Because there are three access ramps, the viaduct has a rounded bottom and there is a curve, it has no distinct direction. Therefore the architect felt that the pillars had to be completely round as well, so they do not have a direction either. The 9 pillars are almost identical, they only vary in height. That meant only 4 castings were needed to construct them all. The new cycleway over the turbo-roundabout one day after it was opened. It is already very well used by lots of school children returning home and people cycling for recreation. Sketch and rendering of the cycle viaduct. The south part was built last. The rendering makes very clear how unacceptably close this new infrastructure has come to the farm-house. The viaduct consists of a curved west-south connection with 8 spans with a length between 21.6 and 26.8 metres. The connected north-arm has two spans with a total length of 49.8 metres. With the access ramps on dams the total length of the viaduct is 279.7 metres and its width is 5.14 metres. The cycleway deck that people ride on is 3.7 metres wide from kerb to kerb. (Nice, but I think that should have been 4 metres considering the amount of cycle traffic.) The height of the viaduct is 5.8 metres and the gradient of the access ramps is only 3%. 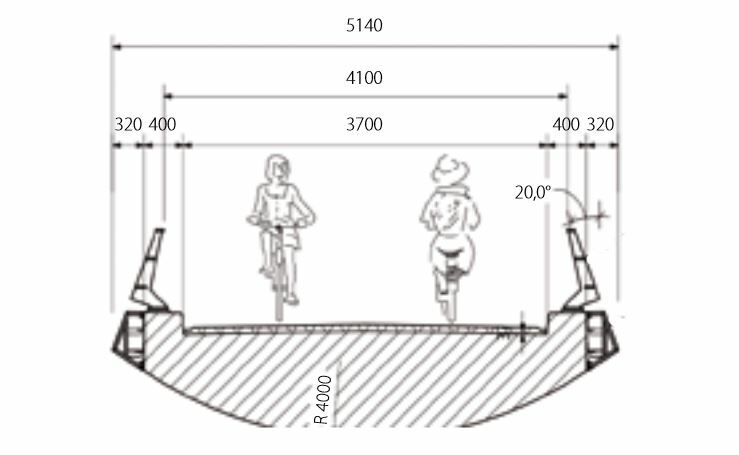 Specific measurements in this cross-section of the bicycle viaduct (in millimeters). An aerial view shows the new canal in the top and it is very clear that the cycle viaduct is directly connected to the bridge over the canal. Left of the new road you can still see the location of the original road. The south arm of the cycle viaduct has yet to be constructed. This was shortly after the original intersection was removed. (Picture via SkyscraperCity). 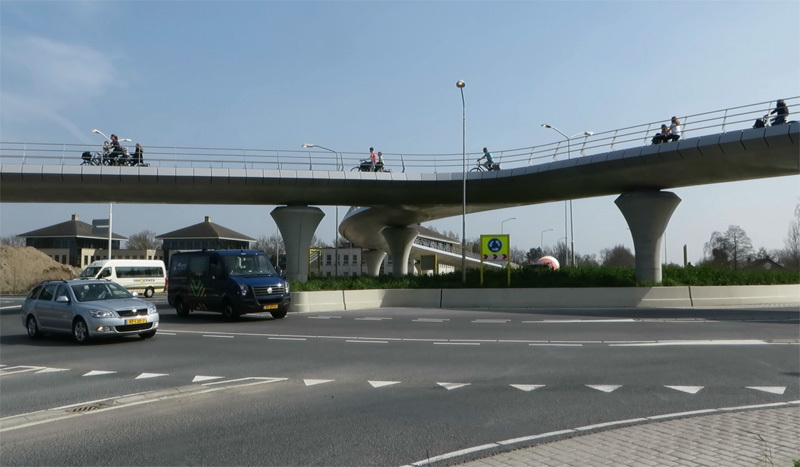 The cycle viaduct over the turbo-roundabout is an asset to the already great and award-winning cycling network in ʼs-Hertogenbosch, but there was one thing that didn’t quite work out as planned. The new infrastructure has come awfully close to an existing farm-house. Initially it was believed that the new turbo-roundabout and the cycle viaduct would be at an acceptable distance, but while construction progressed it became increasingly clear that the end-result is not acceptable at all. Motor vehicles drive almost in the front garden and the cycle viaduct almost touches the roof of one of the stables. This will also make future maintenance more difficult. Rijkswaterstaat (the service of the Ministry of Transport in charge of the canal/road construction project) and the municipality of ʼs-Hertogenbosch have now come to an agreement with the owner of that farm-house. She is a single elderly woman who had already stopped farming. She only keeps horses as a hobby and she does not want to give that up. Her land was reduced in size drastically because of the construction of the canal, but it is still of a considerable size. It proved possible to build a new farm-house with stables for her hobby horses at the other side of her own land. The bulk of the costs for the removal of the old farm-house and building the new farm-house with stables will be reimbursed by the Ministry of Transport. Plan for a new farm-house and horse stables to replace the old farm-house (marked in red). The new infrastructure came much too close to the old farm-house and needs to be removed after all. The new cycle viaduct makes cycling from ʼs-Hertogenbosch to Rosmalen and back again very convenient and safe. Lots of school children will use this route, but also other people wanting to cycle the short distance between these two parts of the municipality can easily do it. The construction of the canal bypass could have meant an extra barrier for cycling. Instead it has made cycling easier and quicker and thus a viable alternative to taking the car. Map by the city of ‘s-Hertogenbosch. I marked the two filmed rides on this map. 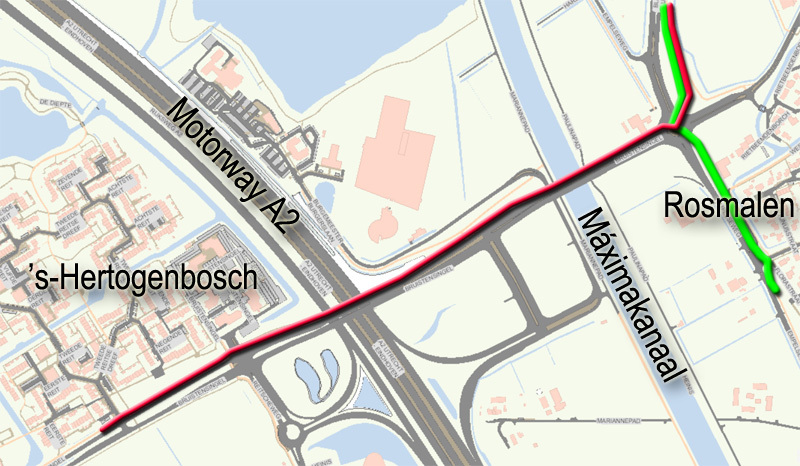 The first ride is west to north-east, from ‘s-Hertogenbosch in the direction of the newest residential area of the city called Groote Wielen (red line). Note that the red line starts and ends at ground level but the route itself is at least 4 metres above ground level. The second ride is from the north to the south (green line). Great post. Great infrastructure. Thank God for the Dutch. Do you know how much the “Sky Ride” cost overall? The reasonable cost of all the previous bridges you’ve blogged about have all been less than 10 million Euro, which in my experience is itself quite a revelation. It’s such a tiny part of the overall budget for the relocation of the canal and all the other road building activities that I wasn’t able to find specific costs for the viaduct. But I think your estimate is way too high considering the comparable viaduct in Enschede cost ‘only’ 2 million euro. How I wish that British roundabouts would have any sort of cycle provision at all. This is a wonderful viaduct, almost fantasy-like in its quality, from a Brit perspective. Sadly British road designers do not care whether bike riders live or die. Why not make the engineers ride without a helmet and without a high viz vest and on an ordinary Dutch bicycle on their new infrastructure and see how they like their infrastructure. Chances are they will not like it. Oh, make them do it during the peak hour. A wonderful idea, sadly impossible. I expect none of them have ridden a bicycle since they were 17; some of them may have never ridden a bicycle. British cycle facilities are almost always designed by people who do not ride bicycles at all, and do not want to, and do not want anyone else to. Some highway designers are actively trying to stop anyone from using a bicycle by “smoothing traffic flow” (which is an English euphemism for “making all cars go much faster”). Only Sustrans paths are designed by people who ride bikes, but as far as I can see they are people who must ride mountain bikes. Most Sustrans paths will have at least one section that is just a mud track and cannot be ridden on any “ordinary” road bicycle. Ik weet dat je je op Den Bosch en Utrecht focust omdat je daar woont en werkt, maar ik heb een suggestie, of meer eigenlijk een vriendelijk verzoek 😉 , om eens te gaan kijken in Amsterdam. Achter het Centraal Station willen ze bij een super druk fiets- en voetpadkruispunt een shared space maken. Naar mijn mening geen goed idee, maar ik ben wel benieuwd naar jouw standpunt. Ze hebben een nieuwe fietstunnel gemaakt, die je vast al eens hebt gezien, die binnenstad sneller met pontjes moet verbinden. Verder gaan ze autoverkeer voor Victoriahotel weghalen, en ze hebben een autotunnel aangelegd aan de IJzijde. Aangezien die nog niet open is en de gehele fietssituatie nog bij het oude is leek het me een goed moment om je even te waarschuwen, zodat je wat ‘before’ beelden zou kunnen maken. Voor de buutnlanders ook wel eens leuk als Amsterdam voorbij komt, 😉 Is maar een suggestie, voel je vooral niet verplicht. The effective width of the cycleway is even narrower than the cited 3.70 m as cyclists will keep distance to the fences. The design manual recommends to have an addition 0.50 m width in case of a fence of this height. Why don’t designers follow such sound recommendations? It happens too often that the width of cycling infrastructure is not properly taking info account the required shy-distance to vertical elements (poles, fences, walls) thus reducing the effective width of the path. In all fairness, the width between the top of the railings is 4.1 metres, (see the cross section image) but I would indeed have loved to see that as the width between the kerbs. Would that be 50cm on each side? That would lead to an effective width here of 3.10 meter, which according to crow is just enough for 50-100 cyclists/hour peak intensity. I don’t know what intensities are expected here? The width between the top of the railings is 4.1m, the width between the kerbs is 3.7m so that would be 0.4m on either side. That is less than the 0.5m which is recommended. So it is cutting is close, but at least it is not just 3.1m! That confuses me. 4.10 – 3.70 = 40 cm, on two sides. That’s 20 cm per side. If you want 50 centimeters on each side, you end up with 4.10 – 0.50 (left) – 0.50 (right) = 3.10 meters effective. Oops! you are right. 20cms on either side. So if people cycling do indeed stay away 50cms from that edge you do end up with an effective width of just 3.1m. No wonder it felt so narrow. I think “zoete lieve Gerritje” would be a very appropriate name for this bicycle viaduct. ‘Cause that’s the first thing on many people’s mind when they hear ‘s Hertogenbosch mentioned (“dat gaat naar Den Bosch toe….). Wondering if there might be problems cycling on the viaduct with a strong cross-wind. Looks very exposed. Good point. Although I don’t really expect people to have problems staying on the bridge, a wind breaking railing like on the Naaldwijk ‘Snelbinder’ would seem to have been more convenient. I was wondering about that too. The railing does seem to be specially constructed to divert the wind, but on the other hand it is quite open. Although the elevated cycle viaduct is very nice, I must say I am appalled at the roundabout design. Although the corkscrews are present to spin motorists outward from inner to outer lanes, the entry points from the approach roads lack smooth connections to the beginnings of the corkscrews. There is no clear leading of motorists in the middle or left lanes on the approach legs to the appropriate roundabout lane to flow into. Drivers are somehow expected to simply turn sharply right in the middle? Unbelievably, we in the US apparently now have superior multilane modern roundabout designs (not to be confused with the gigantic old rotaries in New York and Washington) that are starting to get built around the country. Do you know what the height of the railings are above the cycle viaduct deck? The entries for motor traffic are really very clear. There are 3 approach lanes that correspond directly with the 3 lanes on the roundabout. There is no turning, sharp or otherwise, once you are on the roundabout. The only turn you make is upon entry and it is a good thing that turn is not too wide. Speeds upon entry shouldn’t be too high, because there are no traffic lights. The roundabout design adopted in the US, which is similar to the French and British roundabouts (among others), does indeed differ from the Dutch roundabout designs. The main difference is that in the Netherlands, roads connect to a roundabout almost perpendicular, whereas in most other countries the connection is more tangential and thus smoother. With a smooth connection, the speed of traffic going over the roundabout is generally higher, especially at the point of entry. This has both advantages as disadvantages. The main advantage is that the traffic flow is less disrupted, while the Dutch design is somewhat safer. Since this is almost always a matter of compromise between those two aspects, it is not right to proclaim one to be superior over the other. On a second note, the early designs of turbo roundabouts, the start of a new lane on the roundabout was more rounded, and thus seemingly smoother than the current 90 degree corners as seen here. This is because some drivers entering the roundabout expected drivers on the roundabout to take the inner lane at the start of the new lane, which led to several accidents. Those multi-lane roundabouts have the disadvantage that they allow for side-swipes, which is not allowed with turbo roundabouts. Those are actually so fast that they are usually grade separated from cyclists, not that the US would even consider a grade separation just for bikes and pedestrians. Many cars and trucks in the Netherlands use that sharp turn, and it works very well. The US has the disadvantage that you cycle on the roundabout even on a busy distributor roundabout. Roundabouts worth sharing with motor traffic are the types like those mini-roundabouts you see on bike boulevards to calm traffic or replace a four way stop. I agree that the old rotaries are inferior, but the new modern roundabouts are also disadvantageous to cyclists, who do not even have their own exclusive cycle path, they are usually shared if they even get a path at all, then they have to dismount and walk across, or you have to cycle on the roundabout itself, which is also bad. The Dutch use that as a last resort. Even a curb only .5 metres wide is just enough to make a roundabout with cycle lanes like you see in Zwolle safe enough for a child to use, though if possible a 5 metre wide gap between the outside edge of the car ring and the inside edge of the cycle ring is preferable. This entry was posted on 14 April 2015 by Bicycle Dutch in Original posts and tagged ’s-Hertogenbosch (Den Bosch), big bridge, bridge, exceptional cycling infrastructure, Rosmalen.